Aortic Dissection focused diet has provided me an opportunity to explore new food combinations. These quinoa-tuna patties are full of nutrients & protein. (Mustard makes an excellent condiment). Just like anyone else, an aortic dissection survivor needs protein to stay healthy. Most of our meals are whole food, slow cooked veggie based dishes. Albeit a much slower but still active dissection life day can sometimes leave me with a hearty appetite. So I've been making these Quinoa-Tuna burgers for some time now. They are fast, easy made from just a few ingredients, healthy and delicious. Aorta healthy quinoa tuna burgers are easy to make, grill & delicious to eat. They are good hot or cold! 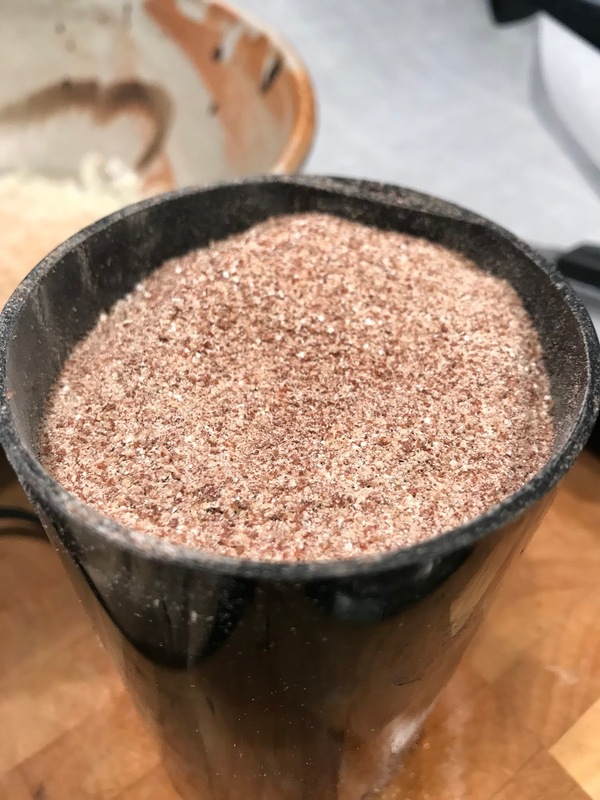 For starters quinoa is generally considered to be a seed and not a grain and reportedly contains most if not all essential amino acids our bodies require. 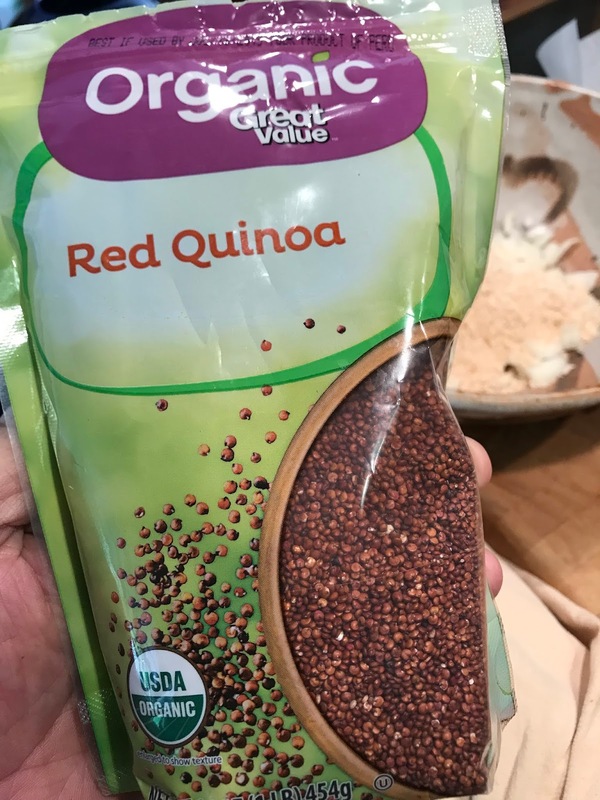 Quinoa is a solid protein food and muscle builder. 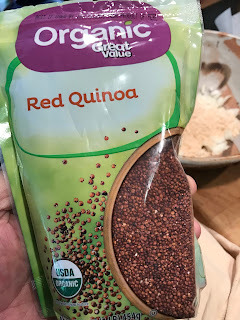 Fiber is another important digestive benefit we receive from quinoa. Quinoa is available in white or darker colors. 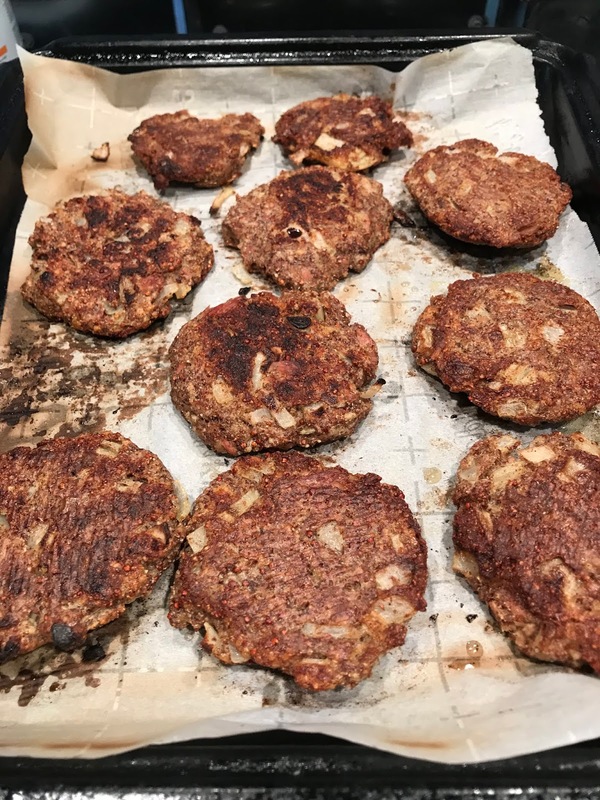 Here I am using organic red quinoa for my #Aorta healthy quinoa-tuna burgers. And I love seafood. Although small fish such as herring are my usual fare, tuna is a once every two week treat. Fresh tuna is always best but if not available then a quality canned or jar supply of the fish will work. 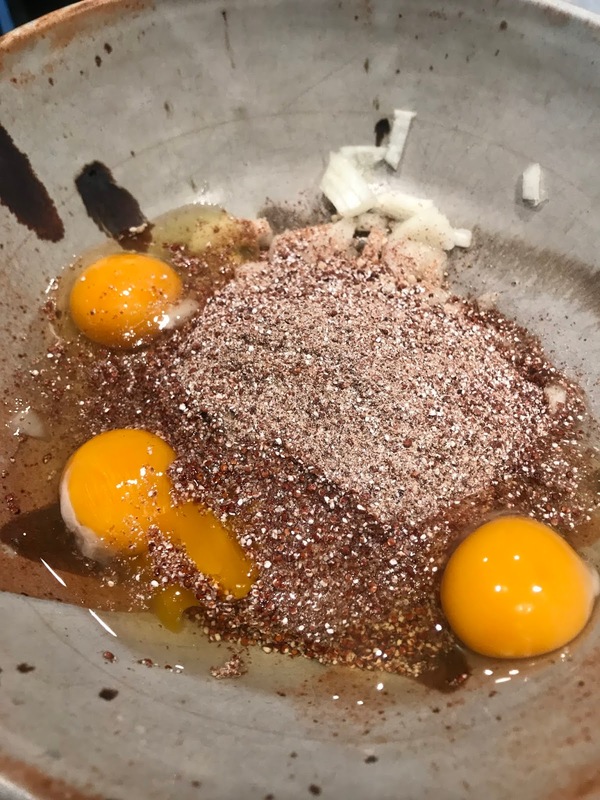 Pasture raised organic eggs add to the nutrients and protein scorecard. Between the tuna, quinoa and eggs one average sized Quinoa-Tuna Burger will provide approximately 15 grams of protein. I can easily eat two, sometimes three. So there is most of my protein requirement for the day. 1. Chop/dice one medium size onion & add to mixing bowl. 2. Fine grind one cup of quinoa in coffee grinder and add to mixing bowl. 3. Open two cans of tuna, drain & add to mixing bowl. 4. Add three organic eggs to the other ingredients and mix until well blended. We always try & use pasture raised hen eggs to receive the maximum #aortic nutrient benefits from eggs. 5. Place parchment paper on baking sheet. 6. Shape burger mix into pattie size burgers (slider size works too) and place on parchment paper. 7. Cook on BBQ grill, med-high (425F) until crispy on both sides. 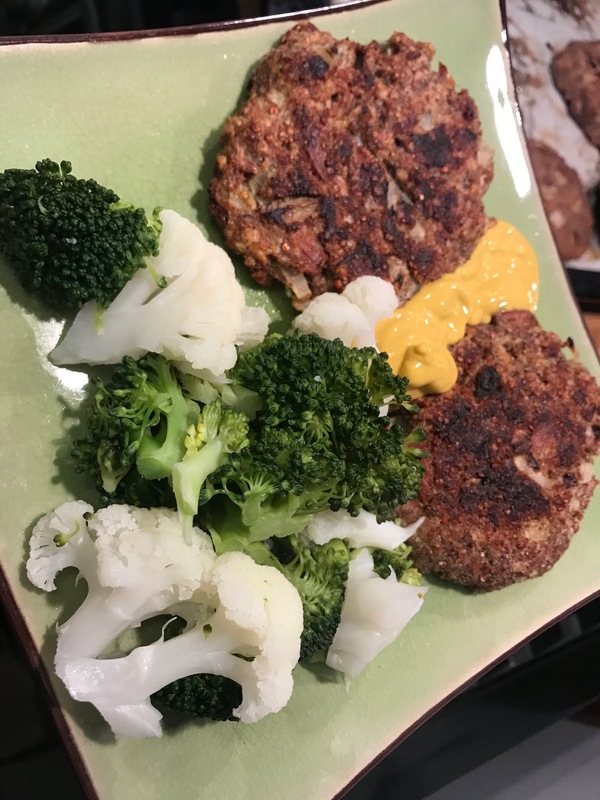 Delicious Aorta healthy diet variety is easy to mix & grill with these quinoa-tuna burgers. 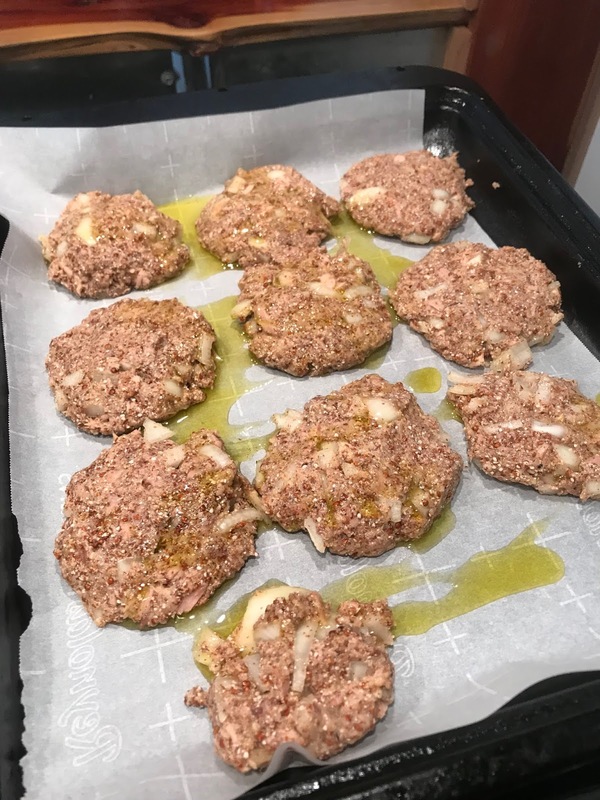 You can serve these Quinoa-Tuna burgers fresh up or sandwiched in between two slices of a healthy bread with fresh veggies. Great way for me to get my fill of 'solid-hearty' food when normally eating my simple vegetable-based diet. I've definitely seen health benefits from my whole-real, home-cooked diet. My last HDL/LDL blood work ratio scored in the 'extremely healthy' range. One of the easiest ways to keep my mind off my existing #aortic dissection and other #Marfan related conditions is through regular participation in art therapy. Aortic Dissection Health can benefit from Art Therapy. This piece by Kevin is a mandala featuring thyme and mermaids. 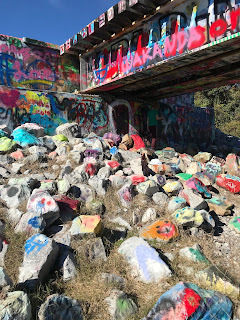 Art therapy can involve any number of creativity modalities, including; music, painting, sculpture, writing, poetry, culinary creativity, wood carving, metal working, dance, yoga, wilderness hiking, and much more. One of my favorite forms of art therapy poetry is short verse such as haiku, senryu and hiaga. Painting is also a personal enjoyment and I especially like to use pigment with wood and a torch. 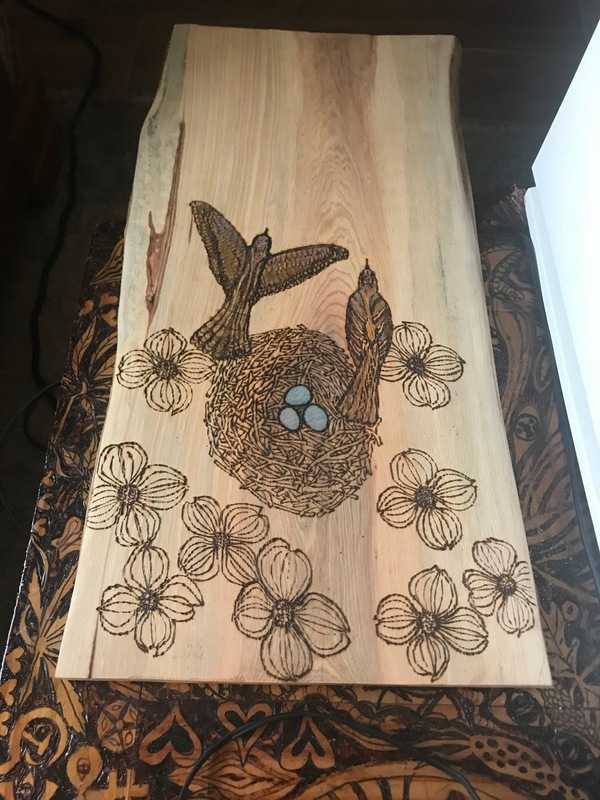 Aortic dissection healing, especially related PTSD and anxiety issues, can be helped through art therapy. Digital vector art too is another great form of art therapy for me. And I'd never pass up a chance to cover surfaces in graffiti! Aortic dissection health benefits from open air art, like 'legal' graffiti! Each individual will always have their own preferences and styles of expressing themselves through art. Aortic dissection art therapy is all about becoming 'lost' in the art process & forgetting stress or pain for a time. Art therapy has been a very effective management tool for my PTSD and ongoing anxiety and pain post dissection. mutt stares at my chest". There are some really good art therapy resources on the internet, including the American Art Therapy Association. I have to admit that when I started out I couldn't draw a straight line. But my motto is keep trying! Pull out your crayons and colored pencils, or brushes and paint and give it a try. Sure does help me take my mind off Marfan Syndrome and an extremely dissected aorta. Coffee has bee shown through studies to be good for one's health in a number of ways. Aortic Dissection. Replacing coffee with marshmallow tea for Barrett's Syndrome caused by my medications. I'm now drinking marshmallow tea in the morning and I love the taste. Marshmallow tea is easy to make. 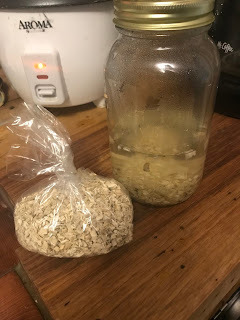 Pour simmering water over the root in a quart mason jar and let seep overnight. Heat up the tea the next morning in your rice steamer. Marshmallow root has a long history of healing inflamed tissue. After reading yesterday's post about my Barrett's esophagus (hey I learned how to spell esophagus) I know marshmallow tea is a healthier choice over coffee for me, personally. So far so good. Marshmallow tea has a rich bold flavor like java with an 'awakening' aroma. I'll update as I see how marshmallow tea interacts with a complicated body chemistry of #aorta medications. #Dissection life is ever changing! #Aorta Two objects on a table, one is my Telmisartan the other a screw driver bit for my drill. Come on. I mean the hardware store manufacturers understand ins and outs of how tools work. Maybe that's because they were once tool people themselves. I would suppose most pharmaceutical company employees are not disabled. Probably some are health challenged themselves or may be disabled. Yet my perception is that most of them are just rich. O.K. That last sarcastic comment was underserved. I am grateful for all my medicines without which I would be roaming the rainforests looking for the right medicinal sprout, leaf, flower or bark. Disability and aortic dissection life is difficult enough without thoughtless non-disabled persons medical packaging designers making life more stressful. The two items on my coffee table above are A. a single Telmisartan pill for my blood pressure I take every morning and B. a screw driver bit for my electric drill (actually its a battery powered drill). So what's the big difference besides the obvious variant uses??? I need reading glasses to see small objects up close. I also need them to read. And I keep all my many various size screwdriver bits in a box, all jumbled up. Yet if I have to use one particular type or size I don't need to stop and put on my glasses and jumble fumble trying to find the right size in the full box because some very intelligent tool person gave thought beforehand realizing an inexpensive color coding stripe might really make life easier for someone looking for a particular size/shape screw driver bit. I call that genius. Thoughtful genius. Probably because the person who came up with the color indicator idea had 'been there done that' looking through a box of almost identical looking screwdriver bits for the right size, wasting a lot of time and probably building up anxiety in the process. But nope for the Telmisartan. Four corners and one of the corners has a tab that is confusing at best for a short clipped fingernail to find and pull back. #Aorta Dissection Life, Telmisartan is difficult at best to open. The back of the pill container does say 1. Tear . Peel. But where do I tear & why is it so difficult to peel? Reminds me of a roll of masking tape that is five years old. You know, that roll where tape comes off in tiny pieces and is impossible to slide a fingernail under any of the layers. I'm not complaining. 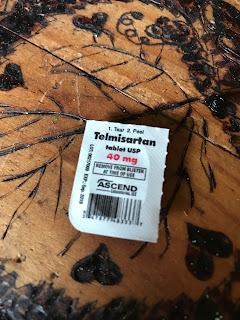 Telmisartan is a great drug IMHO, better so than Losartan for me because of lipophyllic properties and longer lasting effects. Does a better job at keeping my aorta from dilating more. In fact last CT showed a decrease in aortic diameter though I am suspecting the decrease is a variance in the way different radiologists read the CTs. Now why can't the pharmaceutical companies take a clue from the tool manufactures and color the corner of the pill envelope where the tear here part is with a noticeable symbol or color? I don't usually lose my reading glasses but it is a hassle to put them on just to open a telmisartan package. Even more hassling is the, nope - its not this corner, nope - its not this corner, nope - its not this corner, nope - its not this corner, wait - is it this corner? Did I miss the tear here? A really good answer would for the medical industry to hire more health challenged persons or at least seek input from disabled end users as to 'improvements in efficiency'. 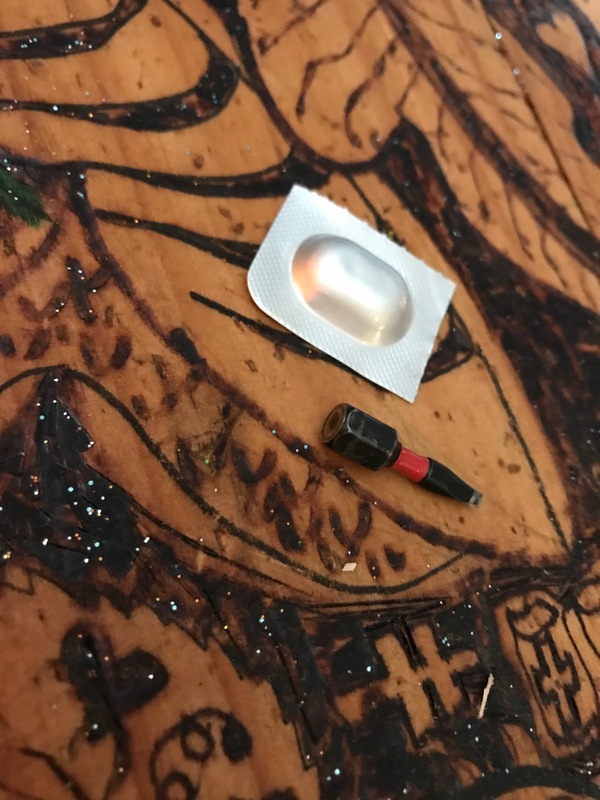 I am sure there are persons out there who have become so frustrated with trying to open these little packets of meds that their stress levels soar as do their bloood pressure. Maybe they even invent curse words I've never imagined. Possibly hammers have been taken to these obnoxious little packages. Its a shame that attempting to use a blood pressure medication actually raises blood pressure. But this is typical disability life, not only for aortic dissection survivors but for all of those who have to struggle to open a package of meds. Yes I'm sure the medical industry can retort with the packaging safety issue answer. But that's not excuse, or if they think it is it is a really lame response. Just add a little red arrow to the package pointing to the corner to tear. Doing so might make the blood pressure medication a whole lot more effective. Want to be the best pharmaceutical company around? Make sure you hire or seek input from the medically challenged. And while you are at it, please add a colored arrow or symbol on the corner I am supposed to 'tear'. 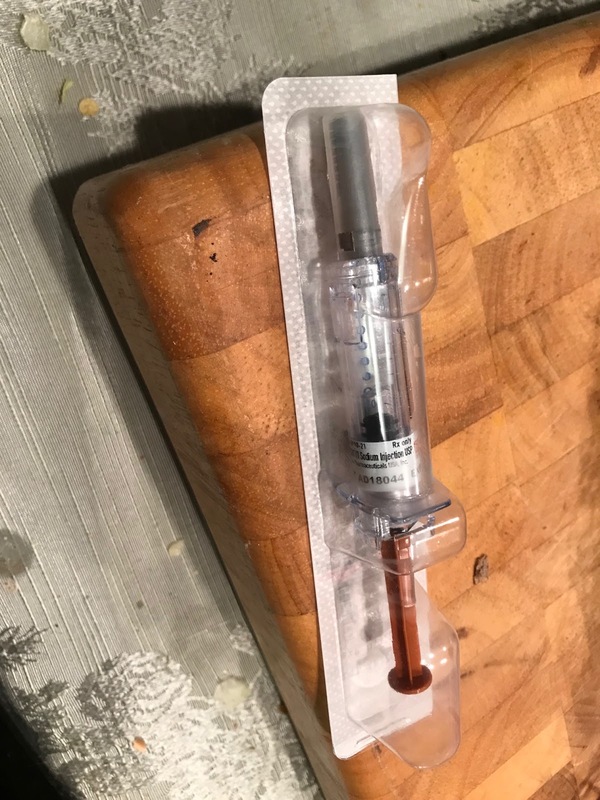 High tech hypodermic syringes full of low molecular weight heparin fill the refrig door. Low molecular weight heparin is commonly know as Lovenox. My cardiologist bridges me off warfarin using Lovenox for a couple days prior to surgical or other procedures. 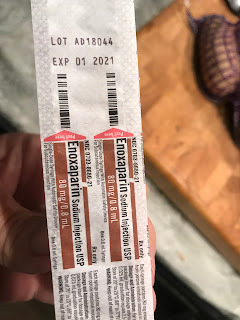 Typically I stop taking warfarin two days before an endoscopy or colonoscopy and give myself Lovenox injections. Lovenox does not usually or significantly affect PTT or INR. Yet Lovenox is also considered an antithrombotic substance and reduces blood clot formation. Since my St. Jude mechanical valve can provide a platform for clot formation I require Lovenox when abstaining from warfarin. 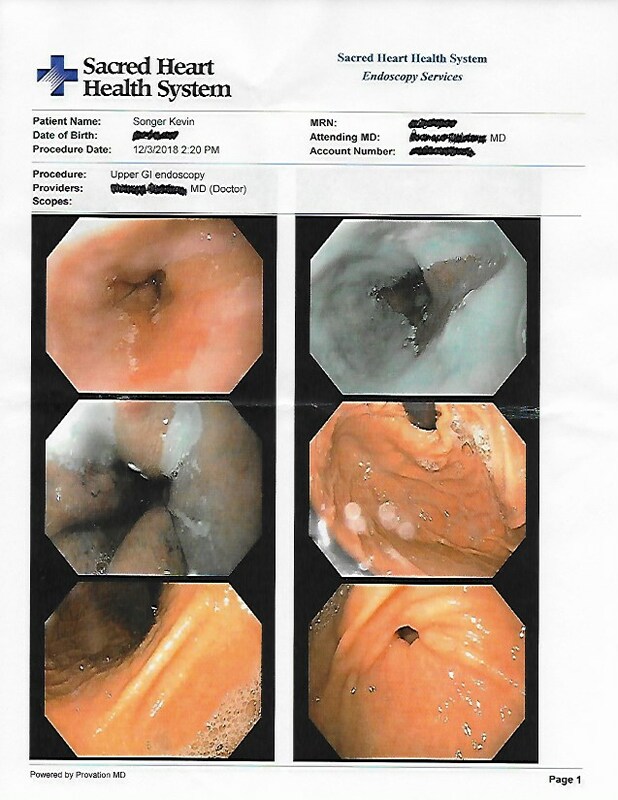 My GI doctor likes my INR to be below 2 when conducting an endoscopy, which I will be having done this upcoming Monday. So I need wean myself off warfarin to drop my INR. 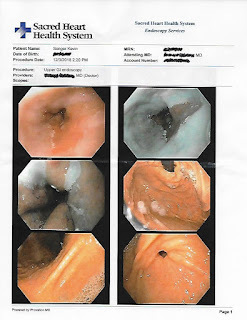 All the medications I've been taking may have been having a negative impact on the mucosa lining in my digestive tract. I suspect aspirin is the primary culprit, along with too much coffee. So I picked up the preloaded Lovenox syringes from the pharmacy. Honestly the syringes appeared to look like something out of a fiction flick. The syringes had an automatic cap enclosure that would spring up to cover the needle once I injected myself with Lovenox. Obviously the purpose of the auto closure cap was to keep someone else from being pricked by a needle in the trash. Being a pumphead recipient though, complicated instruments with multiple twists, turns, pulls and pushes, springs and levers can be despairingly confusing. 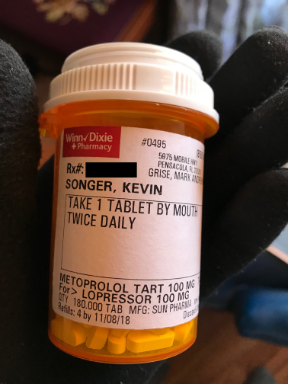 Well, I asked the pharmacist. How does one use these syringes? Do I need to take the cap of the needle? Hmmmm, he replied. Let me see. The pharmacist looked at the syringes. I've never seen these automatic cap closure types before. No, I think the cap stays where it is. You should be able to push the cap against your stomach and the needle goes through the cap and injects you with the Lovenox, then springs back inside. Oh. Ok, I said. Thank you. I'll give it a try at home. At the house I opened the package and removed the syringe, wiped the injection area with rubbing alcohol and gently pressed the cap against my right stomach area. Maybe I have to push the plunger harder, I surmised and tried again. Sheeeeez. I examined the hypodermic closely with my reading glasses on to see if I was missing something. There were no directions on the package. Ok. One more time really hard and I jabbed. Nothing. Fortunately I'd not destroyed the syringe or had the Lovenox squirt out the sides of the plunger. Fortunately too there is you tube. So I found a link on how to use a self closing hypo and the cap does need to be removed first. Ahhhh as a bona fide pumpheader I possess valuable how-to tools with my youtube magnifying glass option. Injection done and complete. Another tomorrow then endoscopy Monday. Then a couple more days of Lovenox and warfarin until I'm back above 2.5. I am so proud of being able to navigate this high tech world of medicine even better than my pharmacist in this instance. A low sodium diet can provide benefits to #aorta health. The study linked here suggests a highly probably relationship between salt intake and aorta aneurysm and aorta diameter dilation increases. I know personally if I eat salty food during a day my evening blood pressure will increase, systolic by up to ten to twenty points. Salt causes our body to retain water and promotes swelling. Limiting salt intake and adopting a lower sodium diet can pay off with aortic health support. Beta blockers, specifically metoprolol, were prescribed to me after my dissection. For seven years I've taken 200mg of metoprolol each day. Beta blockers are one of the main medications used to managed descending aortic dissections because of their effect at suppressing the hormone epinephrine. Epinephrine is also known as adrenaline. Suppression of epinephrine slows my pulse down and somewhat decreases my blood pressure. A slower pulse and decreased blood pressure places less stress on my dissected aorta, lessening risk of further damage. One of the side effects for many on beta blockers is weight gain. Because our heart beats slower our metabolism drops. Over the years I've noticed my caloric requirements have been substantially reduced due to my slower pulse and metabolism. Staying active is important while on beta blockers if your doctor approves. I find walking is the best way for me to balance my slower metabolism with my beta blocker medication. Check out this link for an interesting article about beta blockers and weight gain. 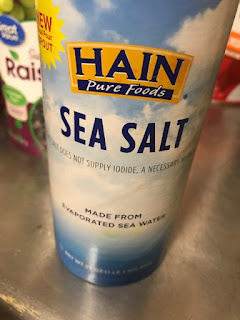 Ran across this interesting NIH article today about how marine sourced omega 3 fatty acids can offer significant cardiovascular benefit. Of course any food helpful to my dissected aorta management is high up on my priority list. Fresh herring grilled is even healthier than the pickled herring I sometimes purchase. 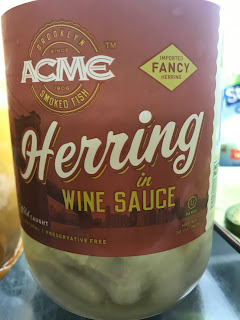 My favorite marine omega 3 sources are herring & sardines & dulse. Dulse is a type of kelp I sauté in coconut oil or olive oil for an excellent, crunchy tasty bacon substitute. Small fish is safer than large fish with respect to mercury and other toxins. Check out the NIH post here.